Effective canopy management – coupled with an effective spray program – is the best weapon against downy and powdery mildew, delegates at the recent Australian Society of Viticulture and Oenology (ASVO) seminar heard. 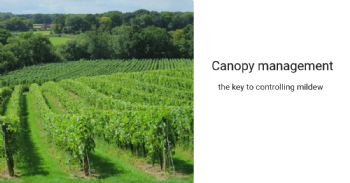 ‘Effective canopy management has a number of benefits. It allows light penetration, improves air movement to allow leaves to dry, and reduces humidity. Most importantly, it also allows spray to penetrate’, Barbara Hall, a Senior Research Scientist with the South Australian Research and Development Institute (SARDI) told delegates. Mrs Hall said both downy mildew and powdery mildew could be managed by an effective protectant spray program. We recommend reading the full text of this article at the original source: click here.